This 2-story mountain log/stone paradise is secluded for optimum privacy. Located just 1 mile from the New River, you can raft, kayak or fish. The decor is country and rustic. The total square feet is 1800 with 900 s.f. upstairs including a master bedroom suite with a king-size bed and master bath with separate shower and Jacuzzi tub and double vanities; a family room with gas fireplace, dining room, half bath and eat-in country kitchen. Downstairs is another 900 s.f. 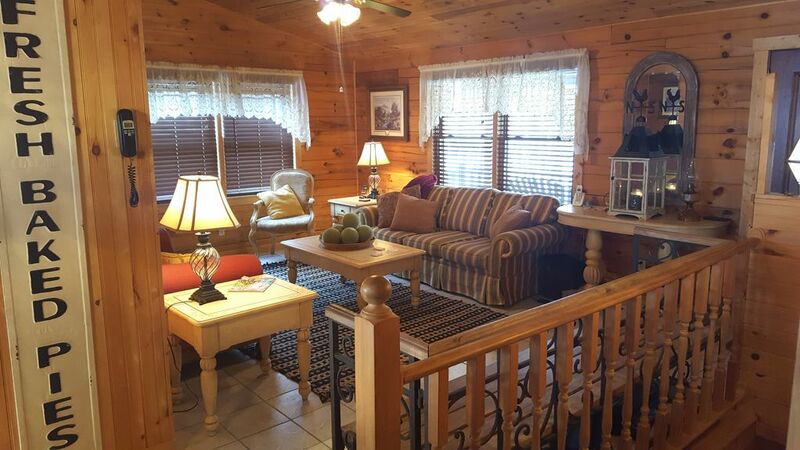 with a family room/game room, a large second bedroom with a queen-size bed, a full bath, laundry room with full-size washer/dryer, and double bunk beds with a large closet in open area of the family/game room. The downstairs sofa is a double hide-a-bed to accommodate additional guests (10 maximum). A rippling creek runs through the front of the property and can be enjoyed from the front covered balconies up/down. You can listen to the sounds of nature and see the sights of wildlife as you drink your coffee on the front porch or back patio. The property is located on a gravel road among several privately-owned log cabins. Don't miss the Friday night 'hoe-down' at the Todd General Store for dinner and an evening of country entertainment! Equipment rentals for rafting, fishing or kayaking are just two minutes away in Todd. You can be in downtown Boone in less than 15 minutes for shopping, restaurants and entertainment. Snow skiing available within 25-30 minutes. The unit provides wireless internet for multiple users, satellite tv with three televisions, and free local and long distance calling. Our home has recently (12/16) been redecorated and gives every guest a cozy, homey feeling. Tranquility and secluded with mountain creek running in front of our property. Free local and long distance at the cabin. Wireless internet provided for multiple users. There is also a built-in dishwasher and microwave. There are three televisions in the cabin. One in the living room, one in the downstairs family/entertainment area and one in the Master Bedroom. The Tranquility is located within 25 minutes of the much-desired ski areas of Boone and Banner Elk. This cabin is a doll house. Perfect weekend get away for extended family! Front porch is so relaxing! Everything was good just no phone service in that area. We enjoyed our stay and would love to visit again. It’s a great place to spend a few days in peace and quiet. My 2 girls enjoyed making a fire every night. The bunk beds were a favorite also. Thanks for your kind and positive review of our home. Hope your family can visit again soon. Have a blessed Christmas and New Year! We stayed in this house in October. It was very clean and had a cozy feel to it. Even though there were heaters located around the house we still found it to be quite cold. My kids loved the bunk beds in the basement. The master bed was super big and comfortable. We had dinner and breakfast in the cabin and we were able to find everything we needed in the kitchen. The sound of the water flowing through the brook outside was my favorite part. My only complaint would be the location being so far from everything. Its almost a 10 mile windey road to a food store. We went on a weekend when it rained so getting up the driveway even in our SUV was a challenge. If you are looking for a place that's quiet and serene away from literally everything, this place is for you. It's great for kids, they will love the basement. We loved the house! Inside is beautiful and well decorated with plenty of space. The steep gravel driveway can be a little tricky for cars to get up but we made it. Short ride to Boone and the New River. Perfect for our vacation. Plenty of space!